Global and unrestricted, all players are welcome no matter where they are. Free and instant deposits and withdraws of any amount 24/7. The casinos save so much money in transaction fees and charge backs that they can give better payouts. Playing anonymously makes it impossible for a casino to limit you for winning too much or to sell your details and credit card information. Anonymity also makes it easier to avoid legal restrictions and tax burdens. Bonus: 100% first deposit, 50% second deposit and 25% for every further deposit. What we like: The best live dealer casino we have ever seen! All games have full options, features and bet types and the dealers are pretty latinas. Beautiful web desing where everything flows and works like a dream. Huge range of table games, slots, lotteries and keno that are all as good as can be. A+ customer support and transactions. a good poker room and a great sportsbook. 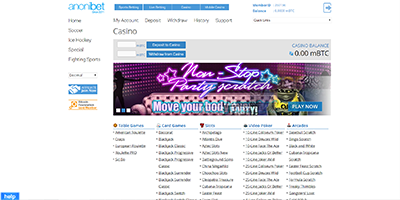 BitCasino is an all round a pleasure to play on and deal with. What we don’t like: Live chat support and some live games not available 24/7. Bonus: 100% first deposit up to ฿1 which can also be used for sports betting and bitcoin casino. What we don’t like: Live chat support and some live casino games not available 24/7. Bonus: first deposit 100% up to ฿0.3, second deposit 25%, third deposit 50%. What we like: The most visually stunning and tactile 3D table games we have ever seen. The fact that all games are provably fair and the 24/7 live chat. They have a fantastic live casino (yes its the same one as BitCasino). Lastly we like BitStarz as if they were a friend, BitStarz actually has a personality that comes through in the great web design and user experience. What we don’t like: We would like more table games, faster load times and live chat to be there 24\7. Bonus: 100% first deposit up to ฿1 which can also be used for sports betting and poker. What we like: Fun and entertaining casino with full range of table games, card games, slots and a decent sportsbook and poker room. Betcoin are the biggest and best online casino, sportsbook and poker room to accept litecoin! What we don’t like: Transactions and going between products can be clunky and frustrating. What we like: Fast transactions and sharing the balance with bitcoins best binary options and dice site. What we don’t like: Small range of casino games, small max bets and un-intuitive clunky game software. Bonus: 10% Rebate on parlay/multi-bet sportsbook losses. What we like: One of the oldest, most reliable and trustworthy bitcoin gambling operators. They also have a sportsbook with live betting. What we don’t like: Plain website and no live dealers = not much fun. Anonibet block players in some jurisdictions and transactions are slow. What we like: Reliable and trustworthy operator with provably fair classic card and table games. They also have an ok sportsbook. What we don’t like: Unattractive design and clunky games. No slots and need more novelty games for funsies.